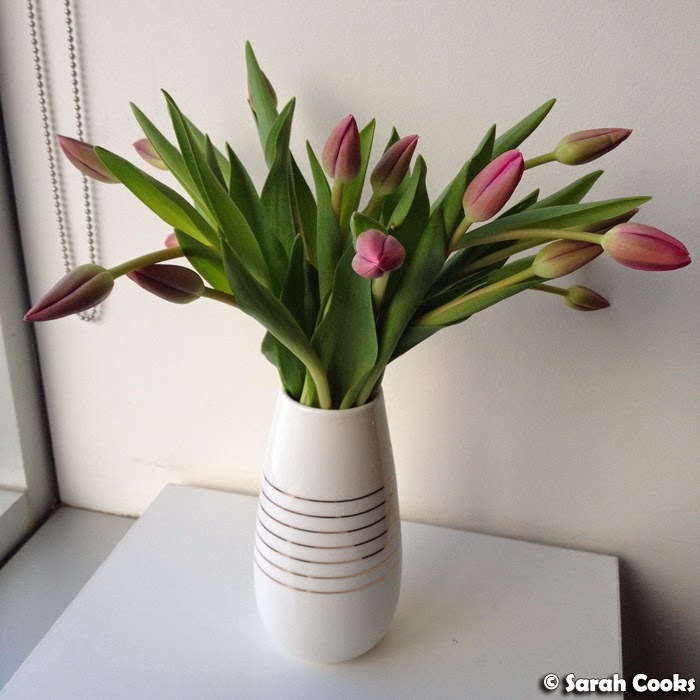 Sarah Cooks: Happy birthday to me! 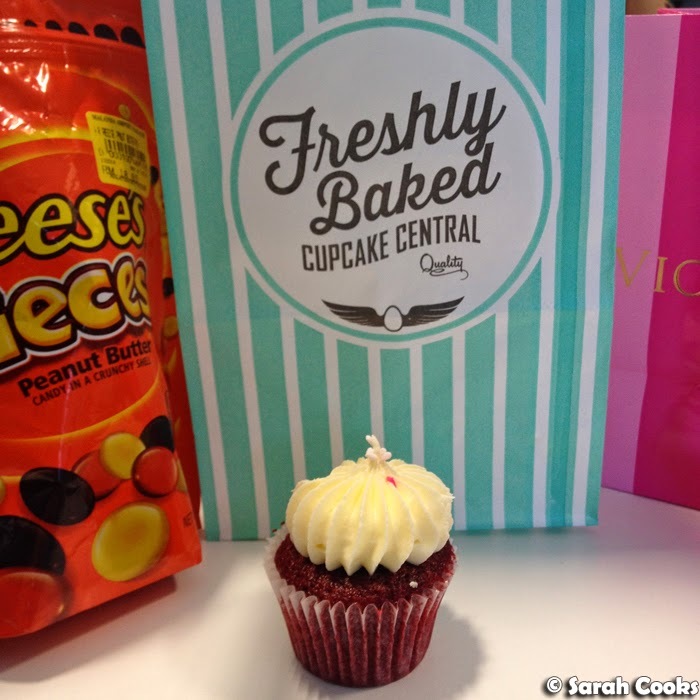 If you follow me on Instagram, you'll see that my #sarahturnsthirty celebrations turned just a little bit epic. Let's have a look! First up was a dinner at No. 8 by John Lawson in Crown with some coworkers. 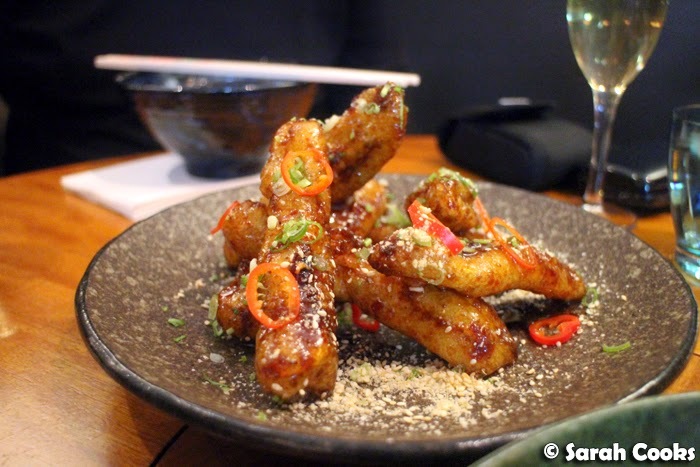 I was nervous suggesting an expensive restaurant that I hadn't visited previously, (well, not since they got a new chef), but luckily it was all really good! Phew! 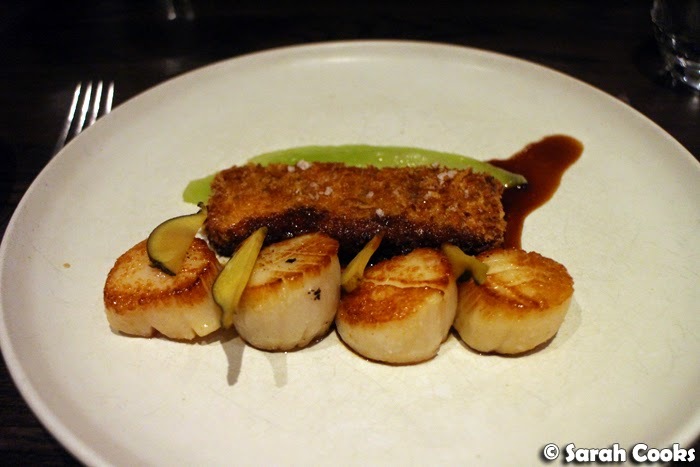 I loved my main of seared scallops, tête de cochon, black radish and compressed melon. Full blogpost to come. 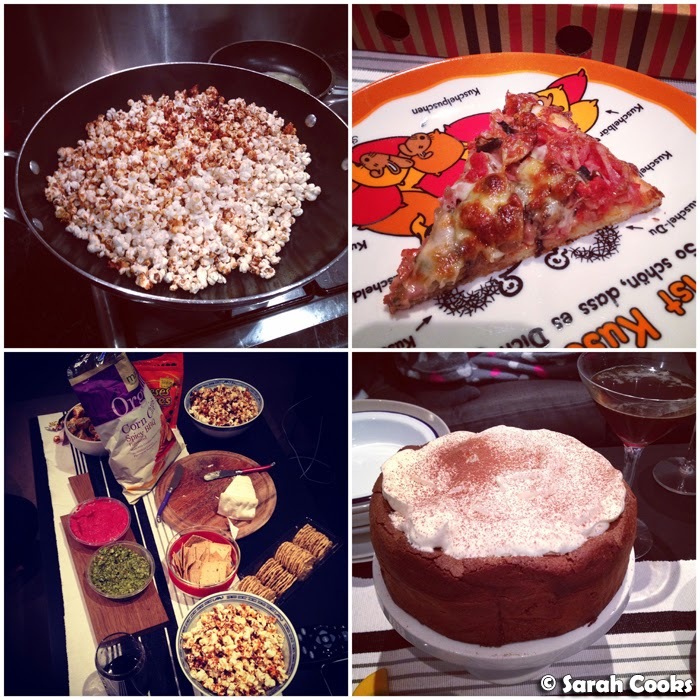 And in total contrast, the next night I had a little pyjama party at home - by which I mean a group of girlfriends, no makeup, slouchy PJs, lots of laughter and even more junk food! I made kettle corn, we ate Reese's pieces, ordered trashy pizza, and drank espresso martinis and wine. Such fun! I also baked a mini-version of Nigella's chocolate cloud cake, and will be blogging my adapted recipe shortly. 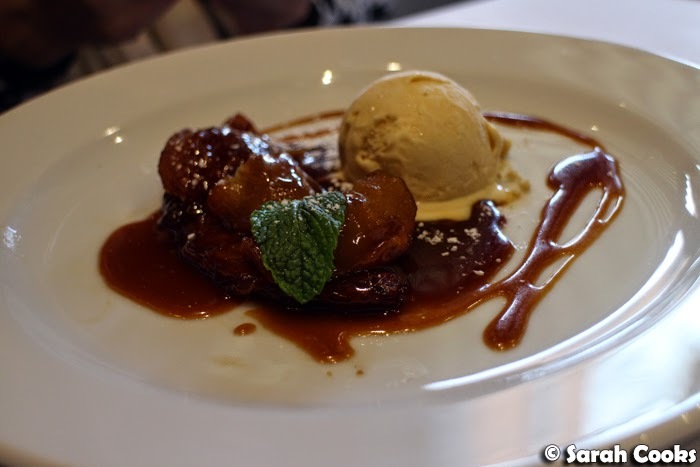 On Easter Monday, I caught up with some blogger buddies for lunch at Bistro Thierry (511 Malvern Rd, Toorak VIC 3142). I'd visited once before and knew it was good (see my previous post on Bistro Thierry), and as a bonus, they do a great value fixed price lunch: two courses with a glass for wine for $35. C'était délicieux! The next weekend, we had dinner at Cecconi's (61 Flinders Lane, Melbourne VIC 3000) with two of my oldest friends - a long night of cocktails, giggles, gossip and delicious Italian food. Back in March, I attended a complimentary VIP Re-Launch dinner at Cecconi's and absolutely loved it, and that's what convinced me it would be a great choice for my birthday! I'll be writing up Cecconi's soon (both the invited meal, and my birthday one), so keep an eye out. The highlight of my birthday meal there was this gorgeous lemon meringue dessert with cassis (blackcurrant) sorbet. 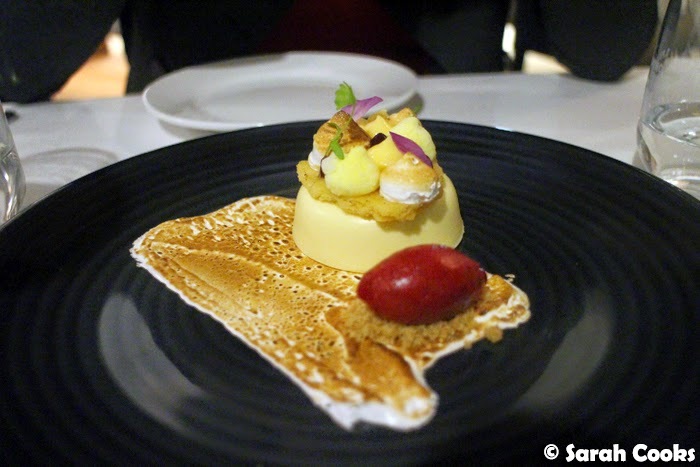 Now, Prix Fixe (Alfred Place, 90 Collins St, Melbourne 3000) wasn't included on my initial list of birthday celebrations, but when my friend Alaina said that my birthday gift was "dinner at a venue of [your] choosing... Prix Fixe??? ", how could I refuse? Of course, we could have waited to visit until after all the birthday bruhaha had calmed down, but we really, really wanted to get in on the "Whole Hog" menu, which was only available in April. 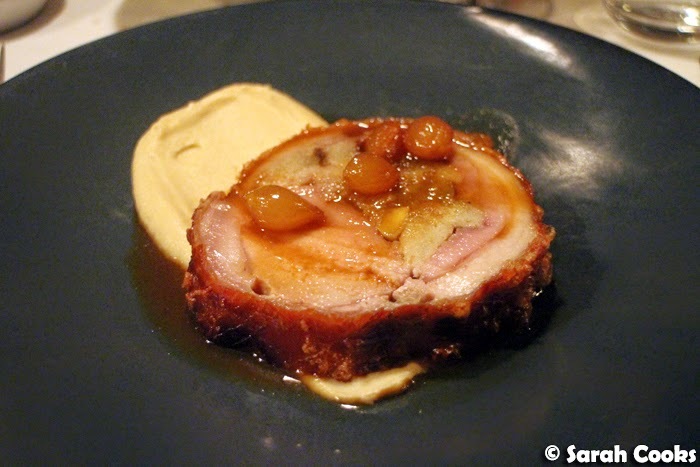 Three courses of Western Plains pork, followed by a Philippa Sibley dessert, was too good an opportunity to pass up! (Obviously I'll be blogging about this too). My actual birthday was a Wednesday, so a normal workday. 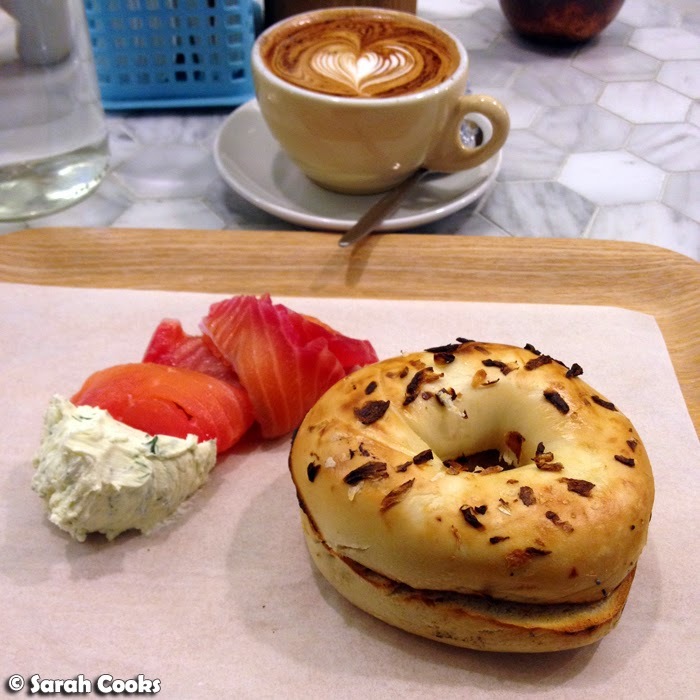 I did manage to get up a bit early and treat myself to breakfast at Bowery to Williamsburg (16 Oliver Ln, Melbourne VIC 3000) for one of my favourite dishes: an onion bagel with cold-smoked salmon (lox) and a schmear of dill cream cheese. 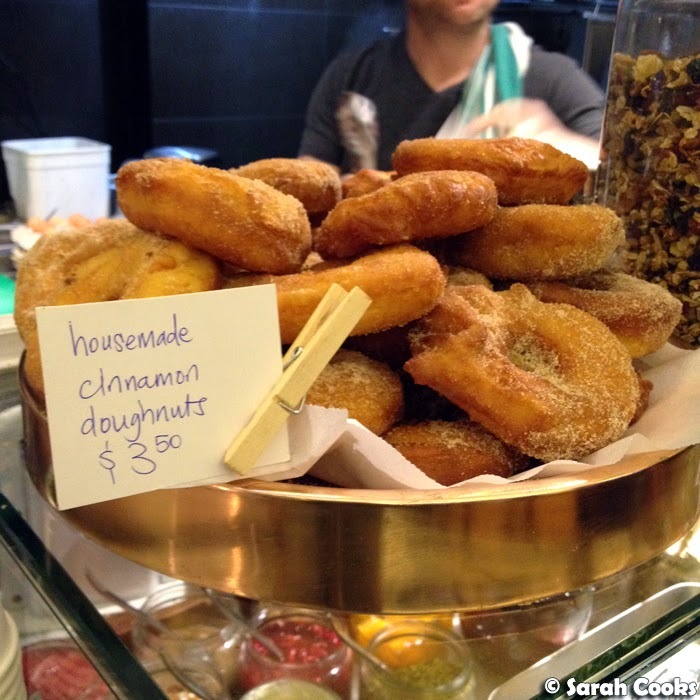 As I was sitting there eating my breakfast, they brought out this incredible pile of freshly-fried cinnamon donuts. So the only responsible thing to do was to buy one on my way out! For lunch, I took advantage of another birthday voucher and got a free Nando's meal! If you have a loyalty card and register it online, you can get a free quarter chicken, burger, or wrap meal on your birthday. (I have a zillion loyalty cards from different places that I never use, but I eat a lot of Nando's so this one has come in very handy). 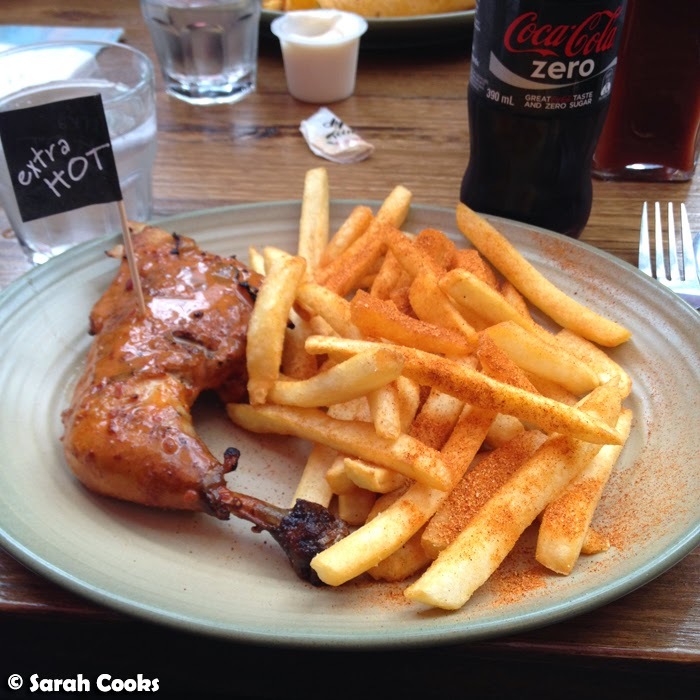 Free Birthday Nando's. Extra hot like me. And after lunch I headed to Cupcake Central (Level 2, Dining Hall, Melbourne Central, Melbourne, VIC 3000) to get some cupcakes for after dinner. 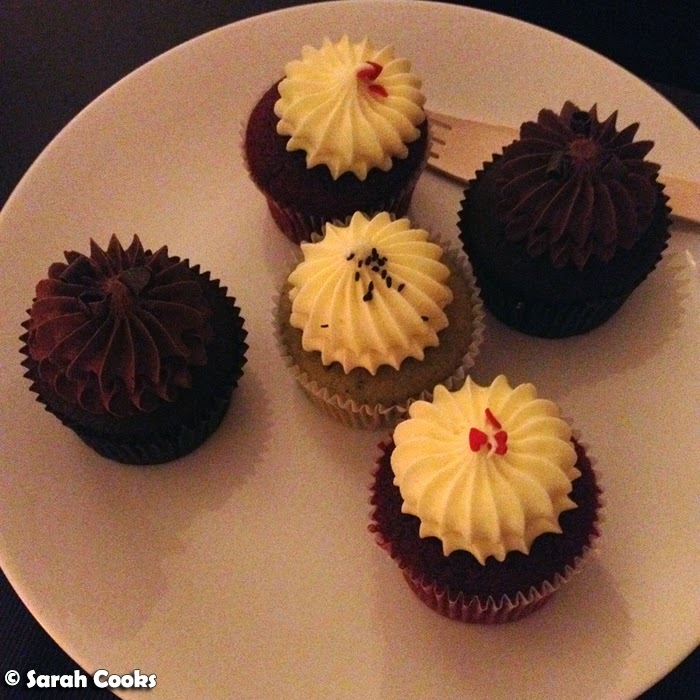 Of course, I couldn't resist buying myself a bonus red velvet cupcake for afternoon tea! Dinner on my actual birthday was at Lee Ho Fook (92 Smith St, Collingwood VIC 3066) with my parents and brother. I know it's one of those so-hot-right-now restaurants, but it was actually my parents who visited first - they read about it in the paper a little while ago, and visited twice in the past couple of months. And you know if Asian parents approve of an expensive trendy Asian restaurant, then the food must be good. (It was). These crisp eggplant chips with red vinegar were amazing! My dad also brought a bottle of Dom Pérignon from his collection to celebrate the occasion - yay! Then we came home and smashed some cupcakes. Yum! Red velvet is my favourite, but the devils food chocolate and green tea red bean (with coconut frosting!) were delicious too. 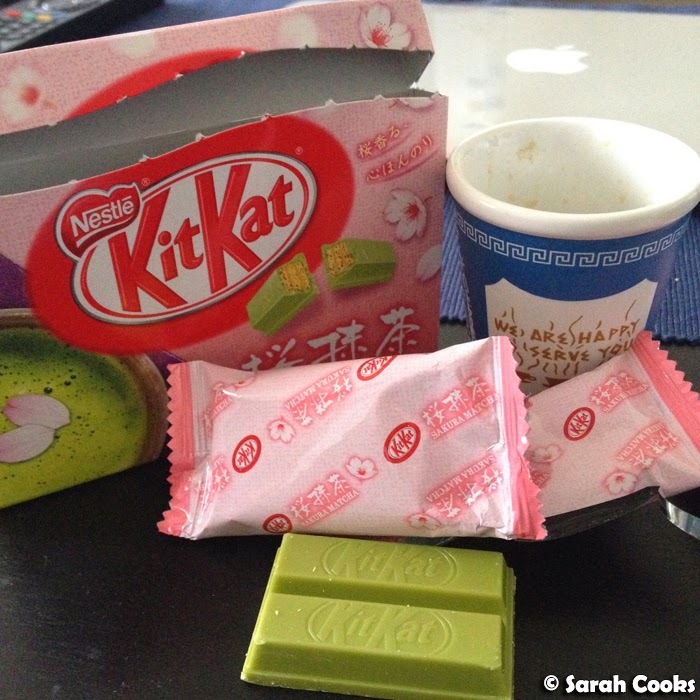 Speaking of sweet treats, my bro also brought me some sakura matcha kitkats from Japan. U~maaai! 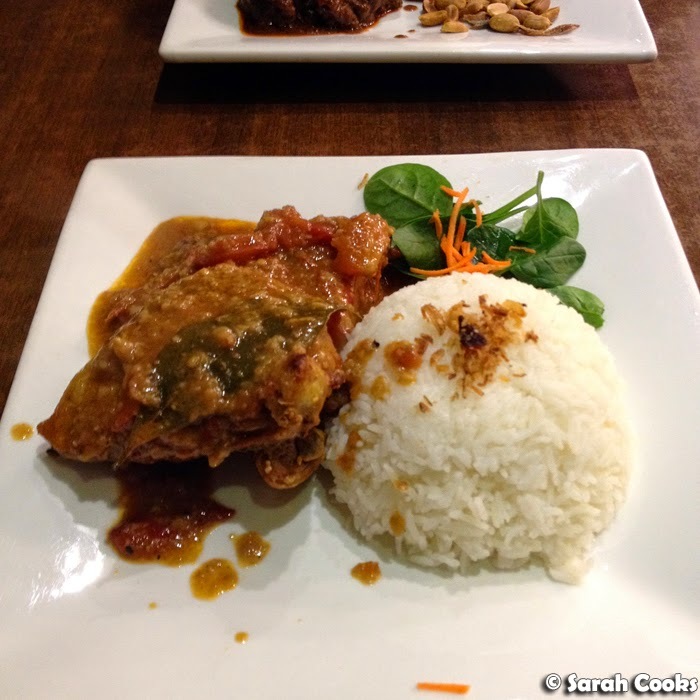 The next day, I caught up with my friend Duncan for lunch at Bali Bagus (85 Franklin St, Melbourne VIC 3000), where I enjoyed a plate of really nice Balin chicken (deep fried chicken in a spicy sauce). Technically this catch-up wasn't specifically for my birthday, but Duncan shouted me lunch so I'm counting it! 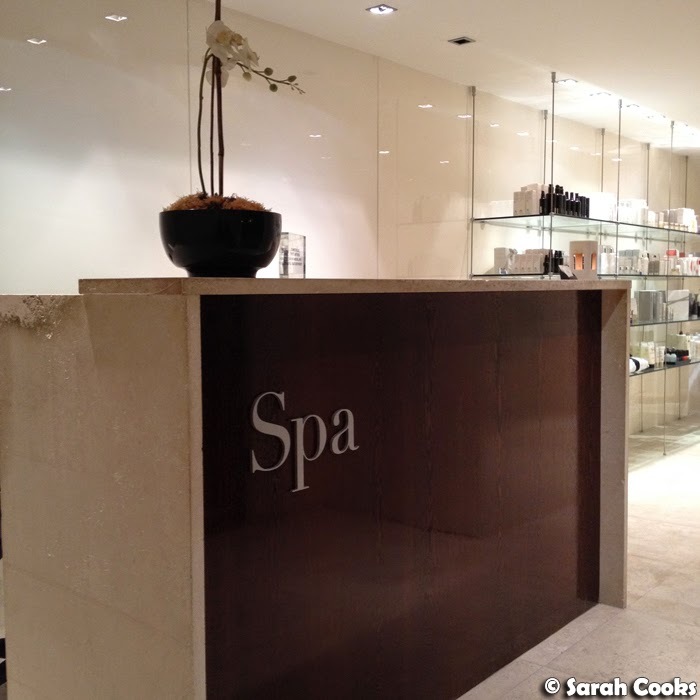 And finally, my birthday gift from Sandra was a totally indulgent day at The Lyall Spa - there was a limo, there was a massage and facial, there was a fluffy fluffy robe, there was lunch, there was a bottle of Dom Pérignon! Amazing! Such luxury! I'll be blogging the experience in more detail because it was so awesome! And now we come to the end of the post. Phew! I think I need a month off to recover from all of that celebrating! But as if all that weren't enough... there are a couple more foodie birthday gifts coming up: my cousin is taking me to Nieuw Amsterdam for dinner as a birthday gift next week, and we're off to Mildura this weekend for yet another dinner! I'm so lucky! Can't wait! What a wonderful way to celebrate your birthday. So much delicious food ... the crispy eggplant looks to die for!! What a great way to celebrate your 30th! I prefer catching up with my friends in smaller groups over big bashes too!